New York Times bestselling creative team John Layman and Rob Guillory will unleash the final one-shot chronicling the action-packed exploits of the beloved homicidal cybernetic kung-fu rooster this April. Poyo, the secret agent; Poyo, the warrior chicken—and now: Poyo, the demon chicken. The final episode of the groundbreaking and historic Poyo trilogy: DEMON CHICKEN POYO. Hell wants him. Heaven won’t take him. Earth needs him. That was also the tagline for that godawful Constantine movie. But Poyo is so badass, he stole it from Keanu Reeves! “We expect this book to shake the very foundations of the comics industry, with a comic so astonishing and impossibly amazing that the world will be forever altered,” Layman added. “Religions will be formed around this comic. Monuments will be built. This is the seminal comic for the 21st Century, and quite likely the new millennium. The wise consumer will buy multiple copies, and the canny retailer will stock their store shelves with this comic, and nothing else." 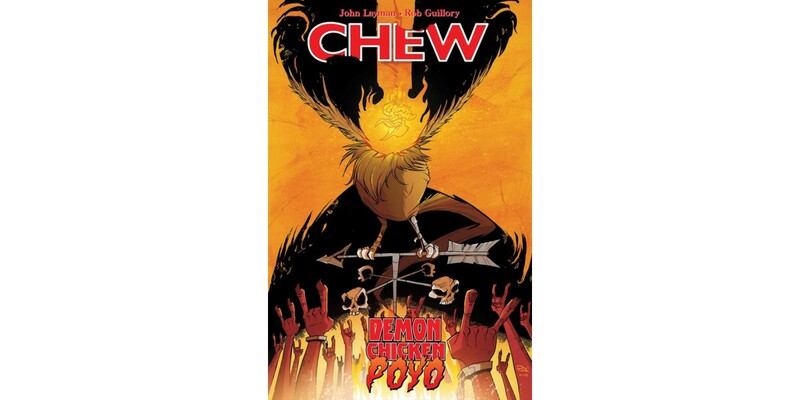 CHEW: DEMON CHICKEN POYO #1 Cover A by Rob Guillory (Diamond code: FEB160499) hits stores Wednesday, April 20th. CHEW: DEMON CHICKEN POYO #1 Cover B sketch variant (Diamond code: FEB160500) will also be available Wednesday, April 20th. Final order cutoff deadline for retailers is Monday, March 28th.